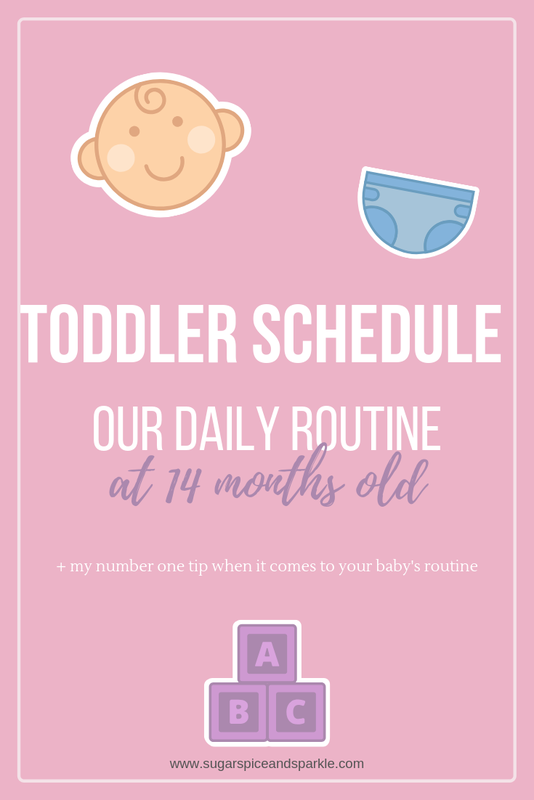 A few weeks ago when I asked for post ideas someone suggested sharing our daily schedule, which I actually did about a year ago, but obviously a lot has changed since them so it's time for an update! I'll start by saying that things are ever changing with a little tot so our daily schedule is actually in a bit of a transformation as we speak. Naps are a little more sporadic and less set in stone than they were just a month ago. I'm going to share what I would call our ideal schedule for a day, but again it's slightly different every day lately and also depending on what activities we have planned for the day. My number one tip for all moms is to be flexible. I read so much when I was pregnant and shortly after Avery was born about the importance of routines and how babies thrive off routines. I believe there is some truth to this but being too stringent is just going to stress everyone out. 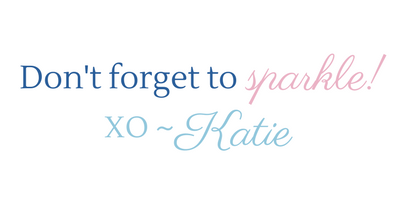 Give yourself and your baby a ton of grace and work through changes together. I'm so thankful I'm able to be at home with her because it's allowed me to feel such a deep connection with her, like I can really read her and know when she's tired, hungry, etc. which has been so helpful in navigating her ever changing "routine". 7:30AM - Wake up. Sometimes it's a little early but she'll usually be fine just chillin in her crib until someone gets her around 7:30. 8 AM - After some play time we move into the kitchen for breakfast. Right now she'll have baby food or some yogurt followed by Cheerio's and her milk cup. 8:30 - 10:30 AM - Play time or outing time. Most days I like to get out of the house at least once so depending on how the morning is going we'll go on a walk, to the mall, or to my parents' house during this time frame. 10:30 AM - Nap time. We will start to get ready for a nap if she's seeming ready, some days she's ready at 9:30 others it's not til noon. But I would say the majority is at 10:30, 3 hours after waking up. Right now she still gets a bottle before her nap and will sleep 1 - 1.5 hours. Noon - Lunch time. After her nap we will go to the potty if her diaper is dry (read more on that here) but if she's already gone we'll change and get her lunch ready. For lunches she'll have some baby food, Goldfish, peanut butter crackers, and little of whatever I'm eating for lunch that day. 12:30 - 3 PM - Play time. Or if we didn't venture out in the morning we'll go out. 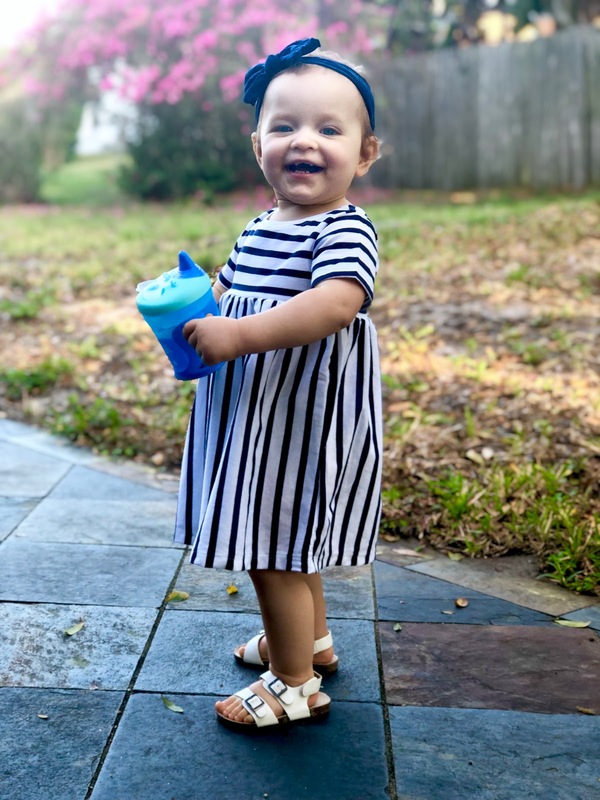 Lately she's also been liking to have an afternoon snack so she'll have some Cheerio's, Goldfish, or Raisins and her milk cup at some point in the afternoon. 3 PM - Nap time again. This nap has given me the most trouble over the last several months. It can be a big struggle to get her to go down (even though I can tell she's so tired!) and sometimes it just doesn't happen, while other days it is not problem at all. I think it's just the phase while transitioning to one nap a day. If it happens, this nap will also be 1-1.5 hours. 4:30 PM - When she wakes up we do a little more playing together and then it's time for me to start thinking about dinner. I'll either connect with Brian and tell him to get Chick-fil-A or something or I'll start cooking. Cooking has never been my favorite and having a little nugget under my feet doesn't really make me any more enthused about it lol. 5:30 PM - Brian gets home and we eat dinner. Avery will have another baby food and some of what we're having. We like that she still eats the baby food because then we know she's getting enough fruits and veggies. Figuring out portion size for a one year old is just such a struggle for me so I like knowing she's getting good nutrients through the baby food throughout the day. 6:30 PM - Bath time! Avery loves the bath! I'll admit some days I'm just too tired so we skip this step. I mean she's a baby who plays at home all day, how dirty could she be? 7 PM - Bedtime routine. After she's all in her jammies and sleep sack Brian will read her books while she drinks her bottle. Once she's finished her milk we brush her teeth, say night-night, and go down for bed. Bedtime is always bitter sweet because I'm so ready for a break but I also miss her almost instantly! Brian and I will watch the monitor and joke about going to bring her in our bed for the night (we never have, the girl is a tornado at night! haha). I usually work on the blog, go on social media, or just straight up relax after she goes to bed! I'm working on getting to sleep earlier myself because that wake up call is always so timely, but it's also tough because I like the uninterrupted work time I get when Avery is in bed. It's a balance and I'm still figuring it out one day at a time! I hope you enjoyed a little look into our current schedule, I know I always enjoy seeing what others do! I'll be sure to update again whenever we fully switch over to one nap a day. If you'd like to chat with other moms about their routines or get advice on nap schedules and meal ideas, join my mommy Facebook group!